Our National Meeting for Instacart workers on 2/13 was joined by eight hundred shoppers & customers — an incredible gathering of voices and ideas about how we can move forward and push for real change from Instacart and other gig economy companies like it. Join the #PayUp campaign by signing onto our three key demands for app companies: A pay floor equivalent to at least $15 for every hour on an active job, plus expenses. Tips on top. And transparency. Get gig workers on other apps involved in the fight by sharing our Shady App Watch tool or filling it out yourself if you work for other apps. RSVP for our next national #PayUp meeting for Instacart workers & other gig workers on March 27 @ 3 pm PST (6 pm EST). What did you miss at the National Meeting for Instacart workers on 2/13? Mia, an Instacart worker from Seattle who’s been a leader with Working WA in speaking out about the gig economy, raised the alarm about massive pay cuts for Instacart workers in December. That’s when we got involved by organizing demands with shoppers in WA: no more tip theft, low pay, and black-box algorithms. From there, things moved quickly. Hundreds of Instacart shoppers across the country jumped on board. We shared a screenshot showing a worker getting paid 80 cents for over an hour of work & went viral. The story got covered in the New York Times, CNN, NBC, Buzzfeed, and more. Instacart denied that they were taking tips for weeks. But because of the incredible support workers built, they finally admitted it & announced they would stop. WHAT DO WORKERS NEED NOW? Workers also shared a lot of specific concerns at the meeting — things like not having item pick pay, and seeing an increase in double, triple, and even quadruple batches paying out as if they were one. Ultimately, most of those issues came down to two things: We’re still getting paid far below what we need, and what we need to make just to get by. And we still don’t know why we’re getting paid what we’re getting paid for each job. Getting Instacart to cave and admit they’d been taking tips and agree to stop (and pay backpay!) was a big deal because it showed that workers coming together really can force the company to do something they don’t want to do. But it doesn’t get us anywhere near where we really need to be: better pay and transparency about how we’re getting paid. 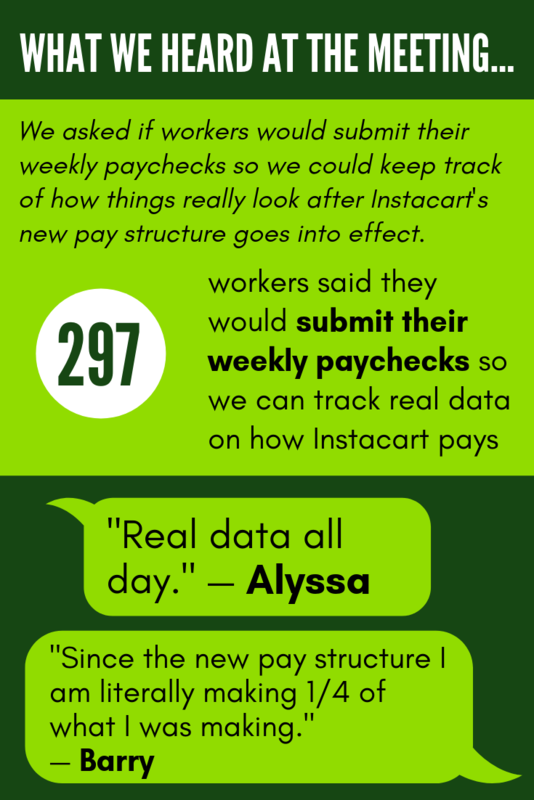 And workers are already seeing new shady moves from Instacart designed to underpay shoppers. The change Instacart made last week required an incredible combination of worker mobilization, almost universal public support, and media attention. It’s not sustainable to try to fight each of Instacart’s issues in that way. So we need to come together around some larger goals and organize for long-term sustainability, with a group of workers who wants to fight for real change at a high level. We’re calling that campaign #PayUp — because that’s what we really need to see from these companies. It’s time for them to reach into their pockets and find a way to spend some of those billions of dollars they’ve acquired to make sure the people actually doing the work get paid for it. We know that Instacart’s promise of a $7-10 batch payment and an end to tip theft isn’t enough. There’s a bigger picture here that matters a lot: the amount they’re actually paying you for all the time you work. If we want to push for real change in how you’re getting paid, we need real data on how you’re getting paid. The company claims shoppers are making $15/hour — but that hasn’t been the experience a lot of us are having. In the coming weeks, after Instacart implements their new pay policy on Feb. 19, it’s going to be vital that we track how much shoppers are actually making. We’re rolling out a tool called “Check Your Checks” that you can use to report your weekly earnings to use every Monday, and we hope you’ll all share this info with us so we can get a sense of the bigger picture. We’ll be rolling out our “Check Your Checks” tool on Monday, February 25 so we can start tracking data from the time the new pay structure goes into effect. If you want to get reminders to submit data and you aren’t signed up with us already, make sure to sign on here so we can get in touch! We’ve set some big goals for ourselves. And Instacart shoppers have made this conversation possible — but the problems with low pay, lack of transparency, and tip theft, go beyond one app. These are problems facing workers all across the gig economy. Instacart shoppers have shown the world that when we come together around a clear demand, we can make change. And we need workers on other apps to know it’s possible for them too. So we’re joining together with other gig workers to fight for real change & real accountability for all the shady companies out there finding sneaky ways to cut workers’ pay. The first step is reaching out to workers on other apps to let them know we’re in this together and ask them to report what’s going on with their companies. We created a tool called Shady App Watch to help us do just that. If you work on another gig app, use the tool to report on it. And either way, share it with other gig workers to bring them into the fight! Instacart isn’t accountable to workers. It isn’t accountable to customers. And it isn’t accountable to the public. The same can be said for other gig companies. They’re going to keep making changes and finding ways to cut pay, and we need to make sure we have a way of holding them accountable to the basic principle that the people doing the work should be paid for it. And in the end that means winning new laws that secure basic rights & benefits for gig workers. We have an opportunity here to harness the power of the conversation Instacart shoppers started by advancing some sharp, clear campaign goals that make sure the company can’t keep playing games, that unite workers across all apps, and that would deliver what workers really need in the end: better pay and transparency. There are a lot of specific issues with the way Instacart pays, and a lot of changes we need to see. But most of them connect to a bottom line, a basic way to measure how they’re doing overall — and that’s how much you’re getting paid for your time. After expenses. That’s why we’re calling for outside accountability: laws that say every job being offered by every gig company must meet the basic requirement of paying enough to make the time — and gas, and car maintenance, and other expenses — that you spend on it worth the while. Our proposal to make that happen: requiring companies like Instacart to meet a minimum pay floor equivalent to at least a $15/hr wage, plus the average cost of expenses, for all the time you spend on an active job. Creating a pay floor doesn’t mean getting paid only that amount — and it doesn’t mean not getting to choose which jobs you do & when. Being able to choose the jobs you want and whether they’re worth it for you to do matters. But if most of the jobs you’re being offered pay too little to be worth your time, that’s a problem. You shouldn’t have to spend all day dodging bad batches to make your pay work. Being classified as an independent contractor shouldn’t be an excuse for companies to pay out less than the minimum wage. Creating a pay floor for contractors would be a bold step in protecting gig workers’ rights, and it’s an ambitious goal. But the concept of a pay floor of $15 for every hour on an active job for independent contractors isn’t unprecedented — a similar law for Uber & Lyft drivers was passed recently in NYC. Policymakers see the possibility of creating a law that protects the flexibility of independent contractor status, while also protecting your paycheck. There are lots of details we need to work out, but the key idea is that companies should be paying you a rate at least equivalent to $15 for every hour on an active job, plus expenses for your work. That should be a bottom line they can’t go below. A tip is a tip. It’s extra. It’s on top. When a customer adds a tip, they’re doing it because they want to give a little extra to the people doing the work. Nobody wants to be tipping a $7 billion corporation. So let’s make that real. We need a clear and sharp legal definition that tips are on top of pay. Tips are a supplement to pay, not a substitute. That’s pretty basic. Workers deserve to know what they’re being paid and why. Just like employees get a pay stub, gig workers deserve a detailed breakdown that shows the basic details of the work they’re doing: how long it took, how many miles, what you’re paid, and what “units of work” were involved — items shopped, etc. This is a basic way to ensure real transparency for Instacart workers and people on all different apps. So we can check their work. The beautiful thing about these three demands: Each of them alone makes a difference. And it’s even more powerful to have all these things together. Even better: we can make this happen at all different levels. We can demand it from companies, like we’ve done and we’re continuing to do. And we can create real outside accountability for these companies by passing laws that do these three things at the city level, at the state level, and even (someday) the federal level. And these demands connect workers across all apps — not just Instacart. And more people = more power. There’s work to be done to get there, but right now reporters and lawmakers and lawyers want to hear from workers for a change. Instacart shoppers made that happen. There’s an opportunity to fix something big that’s broken. So let’s go big, and let’s get them to work on new laws that will deliver what we really need. Click here to sign on & tell gig companies it’s time to Pay Up!